Greenhouse Gardening 101 | Gardens Alive! Q. I have been considering getting a 'hobby greenhouse' for the backyard. Do you have any recommendations as to type or features? A. Well, thank YOU, Wayne—I couldn't believe that we didn't have a full-fledged greenhouse discussion in the A to Z archives, but you are correct—and thanks to youse guys, I will correct that lack of info under the letter G right now! 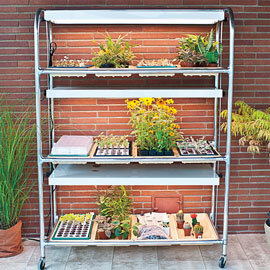 There are, of course, many different kinds of hobby greenhouses. But to me, one of the most important differences is attached vs. free-standing. If you have a South or East facing portion of your home that could accept the addition of a greenhouse-like structure, I would strongly suggest you consider putting it there rather than build a free-standing separate structure—especially in the North, where supplemental heating is going to be a major issue. Let's say your home has a brick or stone wall you can use for the back side of your greenhouse; the sun would heat that wall during the day and radiate it back into the greenhouse at night. If everything is facing in the correct direction, this could provide a monster amount of free, passive heat. And you wouldn't need (or really want) to connect the structures with a costly walk through; the door into the greenhouse can just be on the new structure itself. I had also read a fabulous study that found the root zone temperature of greenhouse plants to be much more important to their survival during cold weather than the actual air temperature inside the greenhouse, so the entire bench on which my plants sat was covered with a heating mat that kept their little rootsies warm at night. It was MUCH less costly than trying to heat the air. And on really cold nights (we had some worrisome record setters that first year), I also turned on one of those oil-filled portable radiators inside the greenhouse, which I probably would not have had to do nearly as often if I had the insulating wall of a house helping out. But equally important as creating heat on a cold night is having an automatic method for releasing too much heat on a sunny day. You would be amazed at how hot a well-sealed greenhouse can get in the middle of winter if it's receiving full sun all day. And, of course, during the warmer days of Spring and Fall, heat can build up rapidly, making an automatic vent an absolute necessity. These are typically a panel in the roof or at the top of one of the peaks that opens up when the temperature triggers a gas filled cartridge to expand and push out a little arm that opens the vent. No electric; it's a passive automaton—although you'll need a real exhaust fan as well if you live in the South and/or hope to use the house during the warmer months. So Wayne in Phoenixville hit it right on the head; the best and simplest use for a greenhouse is to get you started a couple months early and protect your plants for a few months longer at the end of the season—which greenhouses do really, really well. 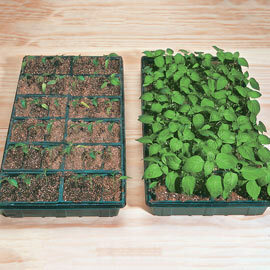 There's no better way to start seeds and/or to coax small plants up to a bigger size early in the season, or to ripen up last runs of peppers and such in the Fall. 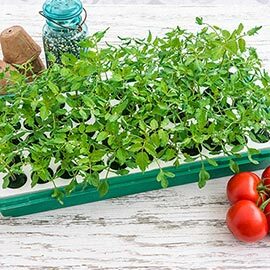 In most climes, a greenhouse is also ideal for growing lettuce, spinach and other cool-weather crops right through the winter. In my part of PA—about an hour colder than Wayne's part—it would also be a perfect place to overwinter plants like rosemary that are just shy of being cold hardy enough to make it outdoors here. But the further North you are, the more expensive it would be to keep tender plants alive all winter, as I learned the hard way the year I filled mine with pepper plants for the Flower Show. If my company Rodale hadn't been paying for the extra electric, I would not have had any tropicals in there; it's much easier and less expensive to keep smaller numbers of those kinds of plants alive under lights inside our actual house house. Bottom line? I like greenhouses a lot; they are fun, addictive and move you up to the Ph. D. level of gardening. …and you'll have a place to garden when others are trapped inside until Spring.